Little Grimm, a free, fun, cute and spooky take on the classic game Snake, is available for download now on the Apple App Store and Google Play. The mobile game was created during the 2017 MassDiGI Summer Innovation Program (SIP) by students Ellen Chen from RIT, Emmanuel Mallea from Becker, Emily Ramirez from MIT, Dean Faulkner from LYIT (Ireland), Tung Vu from Becker, Jenny Sun from RISD and Lisa Jeong from Berklee College of Music. Working over the summer, the team produced a beta/near-release version of the game – watch the trailer here. From there, we brought the game into our LiveStudio program at Becker during the fall ’17 and spring ’18 semesters. Through LiveStudio, more students across a range of disciplines, including business students, had roles in polishing the game and getting it ready to launch. For a roster of all the contributors to the game, check out the credit roll. 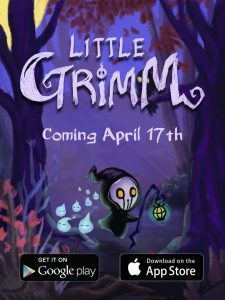 You can download Little Grimm today for iOS and Android.